A few years ago, I volunteered as an education coach with a summer basketball camp and came up with an activity for children to create their own shoe designs. I found an outline of a blank shoe on the internet and had over a dozen designs submitted from children participating at the camp who were between the ages of 5 and 12. This year we decided to present the activity to our Team USAB athletes who range in age from as young as 7 to 11 years. So far we’ve received a couple of shoe designs from our team members. Below is Patrick’s PM52s. We like the stripe design with number 52 and the black, red, and gray shoelace combination! Participants are encouraged to be creative. To imagine if they had their own shoe with the creative control to design their own kicks. In addition, we’ve added the hashtag #HeretoCreate, inspired by an Adidas campaign. In the case of this activity we’re connecting it to the creative world of sports and encouraging children to set aside some time to imagine, color, and create. We have a few other ideas including activities for jersey designs. If you’re a parent of a child age 7 to 12 years and would like an activity sheet to print out for your child, shoot us an email at every1plays@gmail.com. 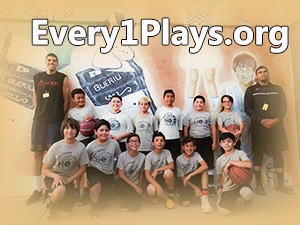 On our website we will feature shoe design submissions, especially those from our athletes at every1plays. On social media we’re promoting the shoe design idea under the hashtag #e1pKicks!